Depending on what part of Italy your recipe comes from, the ratio of flour to potatoes will vary greatly. Some recipes use eggs, some do not. I do.. To me, the key to magnificent gnocchi is how the potatoes are prepared. I think this is important. Don’t boil them, bake them. They come out drier, and the gnocchi end up much fluffier. And no ricotta. I think it makes them soggy. If you want a cheesy product, use a finely grated parmesan–a really good one–and only a little. The ingredient ratios are pretty critical. Preheat oven to 350 degrees. Bake potatoes until easily pierced with a fork (about 45 minutes). Let the potatoes cool slightly, then peel. Pass the potatoes through a ricer or grate them into a large bowl. Add the egg (slightly beaten) to the potatoes. Mix well with a wooden spoon. Add the flour to potatoes a little at a time, mixing well with a wooden spoon. Add just enough flour so that the dough doesn’t stick to your hands. When all the flour has been incorporated, bring the dough together with your fingertips. Remove the dough from the bowl and place on a slightly floured surface. Knead the dough as you would bread dough. Press down and away with the heel of your hand, fold the dough over, make a quarter turn, and repeat the process. the dough balls must be VERY light, like you do when you make matzoh balls. A firm touch on the dough ball will result in a heavy product. You can cook the gnocchi as it is now, but traditional gnocchi has ridges. To create the ridges, press each piece of dough against the tines of a fork. 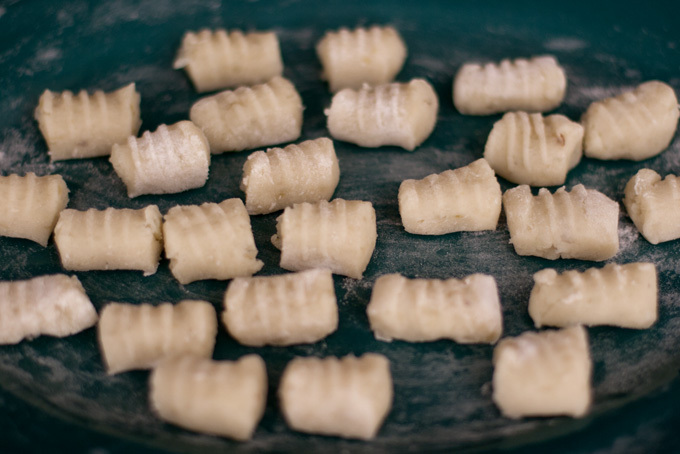 Place the gnocchi in a single layer on a lightly floured dish. To cook the gnocchi, place the dough into a pot of boiling water. After a few minutes the gnocchi will float to the top. Continue to cook for one minute then remove and set aside. Serve the hot gnocchi immediately, tossed with butter and a little Parmesan cheese or with the sauce of your choice. You can also try serving them with sauteed mushrooms in a beautiful red wine reduction, and then beating in some butter. This makes an earthy sauce that make an excellent accompaniment to beef.